The SanDisk Sansa e260 4GB MP3 player with a microSD expansion slot certainly has a lot of features packed into this compact black and blue device. But is it a right fit for you and your lifestyle? After reading the review below, and checking out a few links to other product offerings in the MP3 arena, you should have your answer. As you’ll see below in the Price to Value section, the Sansa model we’re reviewing costs considerably less than similar devices in the iPod family. The 200 series has evolved into quite a nice offering (especially in terms of memory, since that is what the company is most known for really), with every new model outdoing the last. The Sansa e260 is simply loaded with features. It’s a flash based MP3 player with 4GB of memory which essentially means it has room for roughly 1000 songs. It’s got an FM tuner (not so in the European version), plays your photos and videos, a voice recorder, and of course, it plays your tunes. It’s a black, sleek and attractive design that is durable and scratch-proof for you accident prone individuals. The navigation wheel is rather easy to manipulate. You can remove the battery yourself, but whether that is a good thing is subject to debate. Since SanDisk is probably first and foremost known for the various memory cards it has manufactured over the years, you know it has a microSD slot for additional memory. The color 1.8″ TFT screen is a good size for viewing all the video you want. The click wheel works in conjunction with the buttons surrounding it. 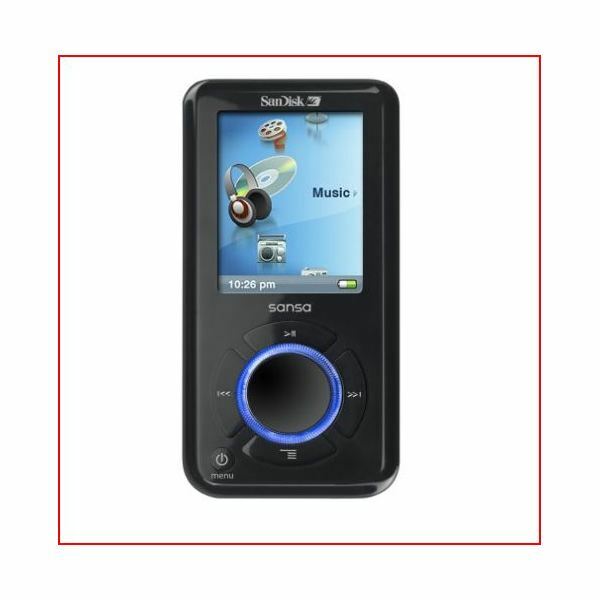 The sound quality is pretty good, but if you’re looking for the best sound you can find, read The Best Rated MP3 Players for 2010. The 20 hour battery life keeps the tunes rolling for 8 hours longer than the iPod Nano. Video may be less than stellar, especially when formats have to be converted using the SanDisk Media Converter that comes with it. In general, if video-on-the-go is your thing, this isn’t the best choice for you. All the converting necessary is time consuming and you might not be pleased with the quality of what you’re viewing. If you’re a photo fanatic and like it when slideshows play with the fade-in and fade-out, be advised that this unit won’t do that for you. It’s easy to see and find what you’re looking for with the backlit controls the Sansa e260 offers. Navigating between music, video, and FM music is extremely intuitive. The software it comes with is seamless and you have the convenience of click and drag for organizing and obtaining media files. The Audio Player readily plays MP3 and WMA formats while options are available to convert other formats using the included Sansa Media Converter. It uses PlaysForSure digital music technology which is available at most online music stores which makes downloading new tunes to the Sansa e260 a breeze. Among your other options for obtaining music are: Rhapsody, Yahoo!, MSN Music, MusicMatch, MusicNow, Napster, Wal-Mart, and MTV’s Urge. But if you’ve already got all your music on iTunes, it’s probably best to stick with an Apple MP3 player. The biggest complaints people have about the Sansa e260 are that the buttons are not that responsive and hard to push and there’s no wall charger included either. If you want an MP3 player primarily for working out, it would be a good idea to check out What is the Best Portable MP3 Player for Runners? for five excellent recommendations. The SanDisk Sansa e260 4GB MP3 player with microSD expansion slot comes out of the box with travel pouch and lanyard, stereo headphones, a lithium-ion rechargeable battery, USB cable, and a quick start guide. You can buy a Sansa e260 for about $42 at Amazon.com. That’s really not a lot of money when you consider all you get with it, and it comes with a one year guarantee. It’s worthy to note that the overwhelming majority of consumers (roughly 660 out of 830) that bought this product on Amazon gave it a four or five star rating.